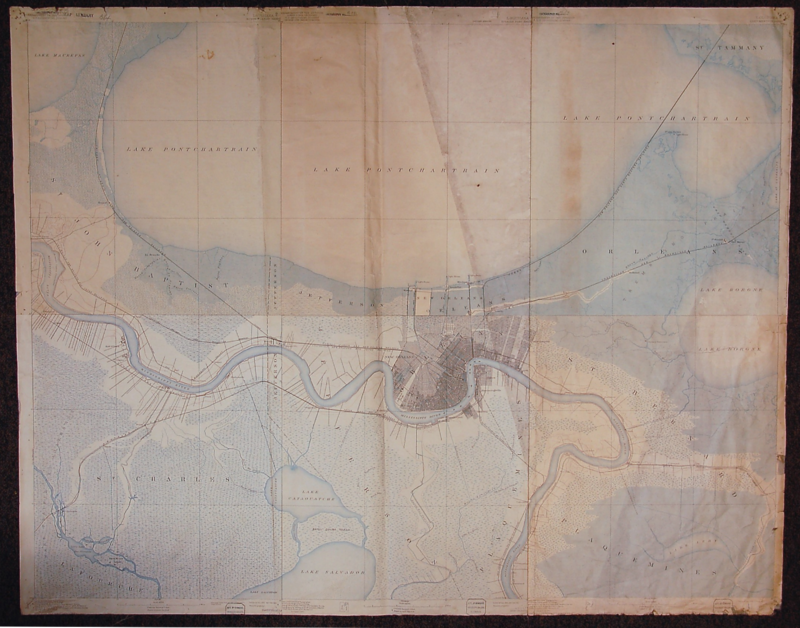 This map consists of six original individual survey sheets of Louisiana, each measuring 16½ by 20 inches. They are a product of the United States Geographical Survey’s desire to produce a topographical atlas of the country, which it began in 1882. Described as being of ‘average public importance’, the ‘problem’ of the Mississippi basin and its tributaries was mapped at 1 to 62,500 scale (1 inch to approximately 1 mile). The overwhelming blueness of the map says that, unavoidably, the problem was water. In the process of stitching the map together, detail for the top panels has been lost. From the legends for the bottom panels it seems the bulk of the surveying was done in 1890, and the maps were originally published in 1891 and 1892 editions. All of the panels are in fact from later reprints, the bottom three dating (left to right) from 1921, 1931 and 1934. It is unclear how they found their way to the east midlands, but the fact that the map is stamped ‘University College’ means it was before Nottingham was granted its full charter in 1948. The mighty Mississippi flows east across the map, through what seems to be an empty, watery wilderness of blue-tinged marsh and swamp. Of course New Orleans stands out, its streets pushing north and east towards Lake Pontchartrain, which interestingly is a comparatively pale blank space. Like generations of Native Americans before them, the French who settled the area in the eighteenth century sought to exploit the area’s bayous to port goods across from the Mississippi to the lakeshore. 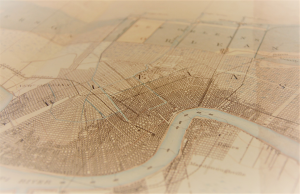 By planting a city on such a low-lying land – the map marks the levees at just 10 feet above sea level – they committed New Orleans to a long war with water, its geographical advantage a near-daily source of danger. This became a devastating reality in 2005 when Hurricane Katrina’s storm surge overcame the city’s flood defences, subjecting the management of the system to intense scrutiny. The Mississippi moved more than sediment, of course. Revolutionary technologies, steam ships and the railroad network that can be seen on the map, supported the economic activity of the antebellum South. Slavery was abolished in 1864, several decades before these maps, but the land systems of the plantations that ran west to Baton Rouge along River Road are nevertheless evoked by the straight tracks and channels the surveyors charted. But the labours of people, right across this landscape, are much more hidden. ‘Map of the Month’ highlights one of over 80000 maps held in the Map Collection of the School of Geography at the University of Nottingham. Each month we present a new map from the collection, covering a range of cartographic styles, places and time periods. Explore what the map shows, why it was produced, and what it means today.